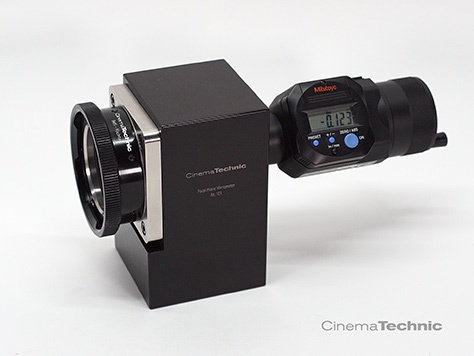 UPDATE: New CinemaTechnic lens testing mounts “Standards” for Richter Cine Collimators and Lens Projectors are now available. We can supply most SLR and rangefinder lens mounts such as Canon FD, Canon EF, Nikon F, Leica M and Leica R. A Sony E / NEX mount is in development. 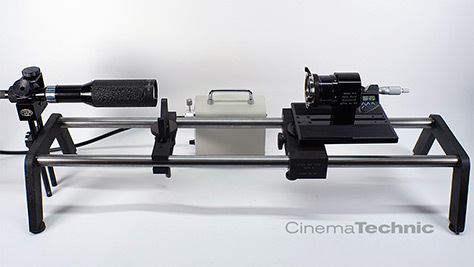 The CinemaTechnic IMS (Interchangeable Mount System) upgrade for Richter Cine Collimators and Test Projectors is also now available. CinemaTechnic is developing focus testing collimator systems and upgrades for existing collimator systems (Möeller-Wedel and Richter Cine). Drawing on our two decades of experience with cine lens testing equipment, including state-of-the-art MTF testing systems by Carl Zeiss, we are bringing dependable precision lens testing and calibration within the reach of even small rental houses. Our new upgrades bring the venerable and affordable Richter Cine system into the 21st Century. The new Fiber Optic Adapter incorporates high quality diffusion, a spectral filter and condenser optics to assure even illumination of the collimator reticle. Along with the 5500ºK light from the LED Illuminator this combination greatly increases the ease of focus adjustment with the Richter Collimator, especially for vintage lenses that do not “snap” into focus as clearly as modern lenses do. We have a small stock of reconditioned and calibrated Richter Cine collimator components. These include the rare 500mm collimator objective pictured above. Please contact us via email with your requirements. 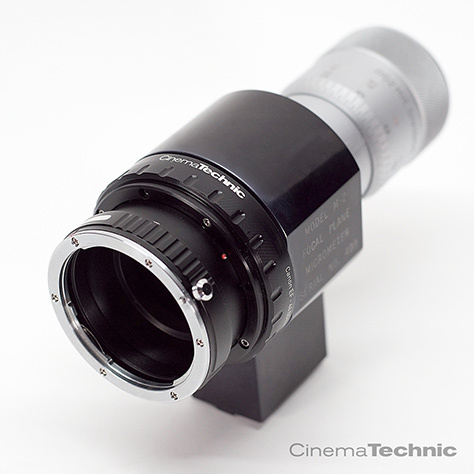 The first new product is the EF mount (Canon) lens “standard” for Richter Cine Collimators and Lens Test Projectors. EF mount is now the second most popular lens mount in professional cinematography, behind only ARRI PL mount. But an EF mount was never offered by Richter Cine. EF mount can be rotated to the desired orientation in 22.5º increments by un-bolting the middle flange and turning it. Flange Focal Distance can be fine tuned using commonly available Zeiss shims, to compensate for wear, temperature changes, etc. High quality Made in USA item. If you need a still camera mount other than Canon EF, such as Canon FD, Contax C-Y, Nikon F, Leica M, Leica R, please contact us via email. 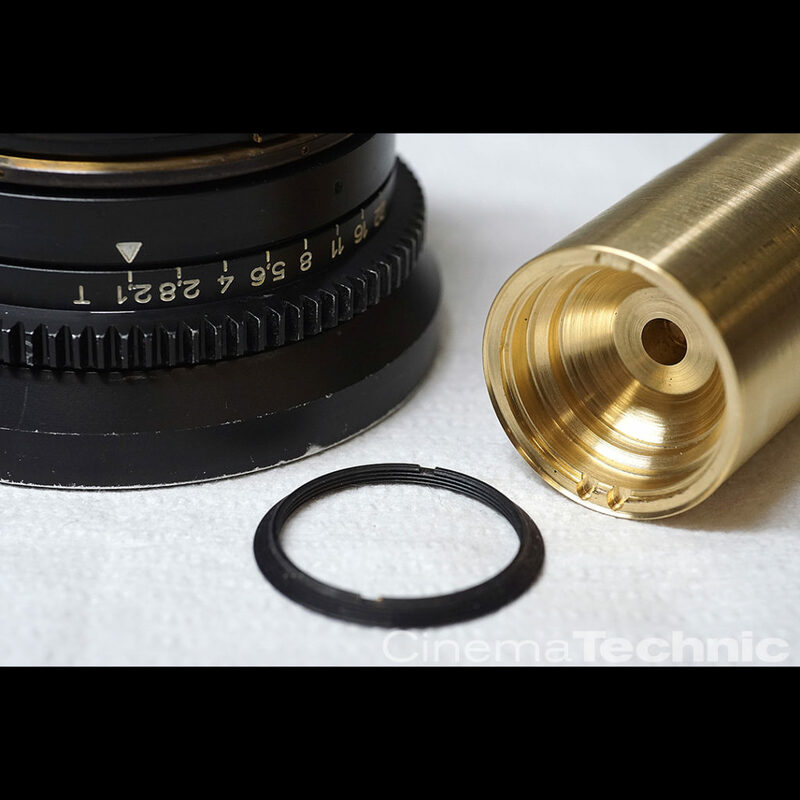 We recommend this type of lens mount for Richter Collimator users that have many original Richter Cine lens standards that they want to keep using, and just need to add another mount. If you have very few or no original Richter lens mounts that you want to keep using, our IMS Conversion may be a better choice for you. 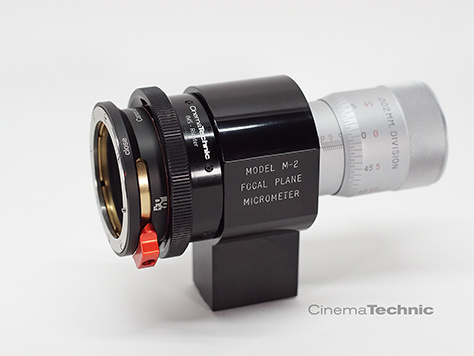 This unique adapter easily converts your Richter Cine M2 Focal Plane Micrometer to IMS (Interchangeable Mount System) mount. Richter – IMS Conversion: Price TBA, Please inquire. No more concern about replacing damaged Richter reflectors (unavailable for 20 years) or the high labor cost of replacement and calibration. Each conversion is precision fitted to the individual Richter M-2 and calibrated. Pricing for conversion of your existing M-2 unit depends on age and condition, but will be lower than the price quoted above. Please contact us via email with photos of your unit. Super precision digital Focal Plane Micrometer with interchangeable mount plate. Industry standard IMS adapter can be easily unthreaded for use with mounts that are too short for IMS. Compatible with C-mount, CS-mount, Micro Four Thirds (MFT) and Sony E mount with IMS adapter removed. What is IMS Interchangeable Mount System? The IMS system was introduced by P+S Technik in the 2000’s as an open standard positive locking intermediate lens mount. 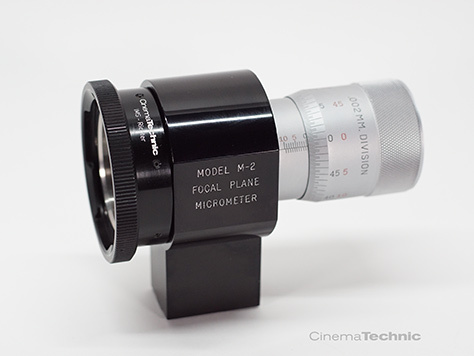 It is similar dimensionally to ARRI PL mount but has a smaller pilot diameter and a much shorter flange focal distance. The IMS system has been adopted by manufacturers of high quality cine lens test equipment, such as Gecko-Cam (collimator and test projector) and P+S Technik (Lens Checker test projector). IMS mounts are available for a wide variety of lens mounts. 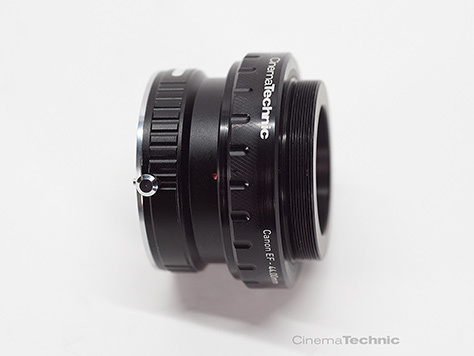 CinemaTechnic can manufacture IMS compatible mounts for many cine and still camera lens mounts. NOTE: The relatively rare Richter Cine Lens Test Projector uses the same threaded mount, but requires special clearancing (larger I.D. and shorter thread length). Lens Test Projector compatible versions of our products are available on special order and require shipping of the lens projector to us for fit testing. 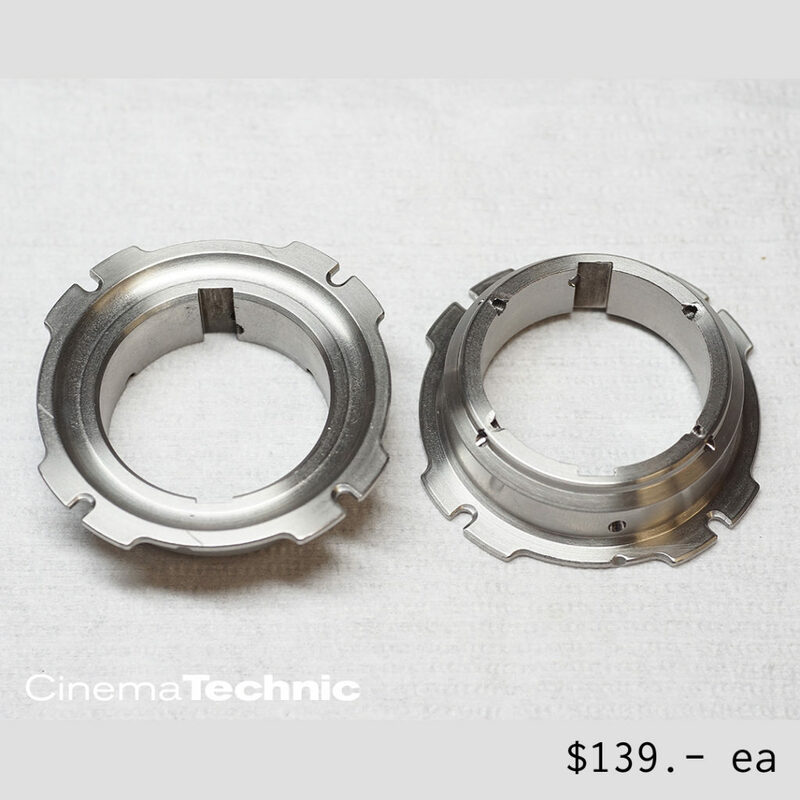 We also have Sony E (NEX) mount and C/CS mounts for Richter Cine under development. NOTE: Products pictured above are prototypes. The production versions will differ slightly due to ongoing incremental updates to the design. UPDATE: This collimator system described in this post has been SOLD. If you are interested in purchasing a collimator system please get in touch via email (see below). 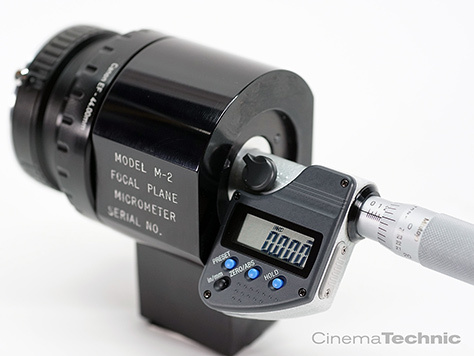 Richer M2M Focal Plane Micrometer with Starret 468M micrometer head, .002mm accuracy, with CinemaTechnic upgrade for easy zeroing. Halogen Fiber-Optic Illuminator with adjustable intensity, fiber-optic light guide. We may have another Richter Cine Autocollimator System available soon. Please check this site for updates. All components of this collimator system have been serviced and brought up to “like new” performance. Compare to Duclos Lenses collimator system at $19,695.- or Gecko-Cam’s collimator system at € 31,700.- (currently $41,158.- plus shipping from Germany). Prices are good while supplies last (which won’t be long). Some items are already sold out. Keep an eye on this space as I will be adding more items. Chrosziel Fluidzoom – overhauled – $185.- ea. Ever wonder what spherical aberration is or what it -really- looks like? I’m not using any kind of diffusion filter, this the image produced by a vintage lens at f1.5. To me, it looks like a toy Ad from the ’80’s. The image above is one of the examples I created for my lens talk, “What Do Cinematographers Really Want in a Lens?” which I’ll be giving today, October 11, as part of Zeiss Cinema Lens Oktoberfest in conjunction with Hot Rod Cameras at our Burbank location 722 N. Mariposa Street, Burbank, CA 91506. The event runs from 3:00 to 6:30 pm. I’ll be discussing desirable technical an aesthetic qualities in a lens, what all those aberrations really mean, and the challenges that lens designers have to work with. You’ll also get hand-on time with all the latest Carl Zeiss still and cine lenses such as the CP.3, Otus, Milvus, Batis, Loxia and Touit. I hope you’ll join us. After months of work, ShareGrid’s Ultimate Anamorphic Lens Test is online. It’s the one place on the web where you can compare 13 different brands of anamorphic lenses. If you’ve ever tried to test anamorphics, you know how hard it is to put together even two sets for a test. 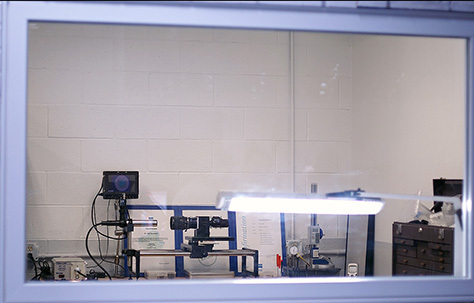 I performed the technical testing of the lenses (collimator testing for contrast and projection testing). I’m also in a few of the videos. The one above is the “What is Anamorphic” section. This project took an enormous amount of work on the part of many people. 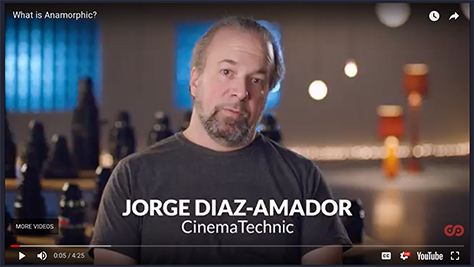 It is a very valuable resource for cinematographers and directors. 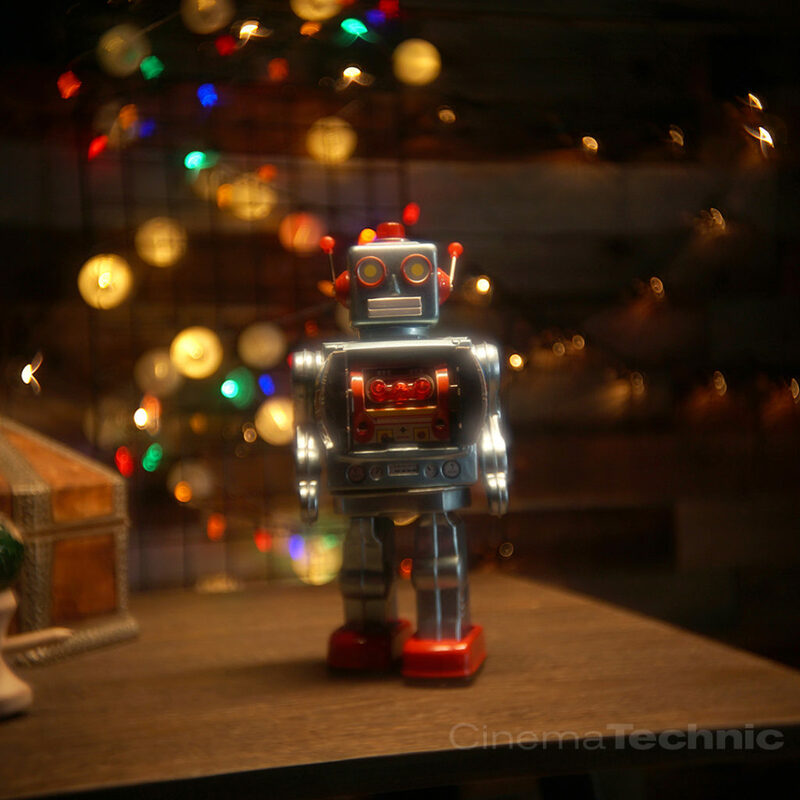 Click here to go to ShareGrid’s Anamorphic Lens Test main page. CinemaTechnic Supporting P+S Technik Optical Products in U.S.
I’m very pleased to be working with P+S Technik again, supporting their optical products in the U.S. 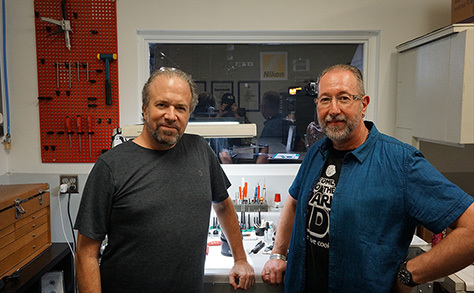 Hot Rod Cameras is now a full-line P+S Technik dealer, and CinemaTechnic shall provide service for all P+S optical products. CinemaTechnic’s relationship with P+S Technik goes all the way back to 2000, when I began sending ARRI film cameras to P+S for the Evolution conversion. In 2004 after my first lens service training at Carl Zeiss Oberkochen, I took the A8 Autobahn on a rainy night (at 160 kph!) from Ulm to P+S Technik in Munich, where I was trained on ARRI film camera service by Peter Eckenweber (pictured above right, I’m on the left). 13 years later I am again training with Peter, this time on the P+S lens rehousings for vintage Angenieux, Bausch & Lomb, Canon FD, Canon K35, Cooke Panchro, Kinoptic, Kowa, Leica-R and Schneider. From this point on, owners of these rehoused lenses will not have to be concerned with needing to send the lenses all the way to Germany for service. 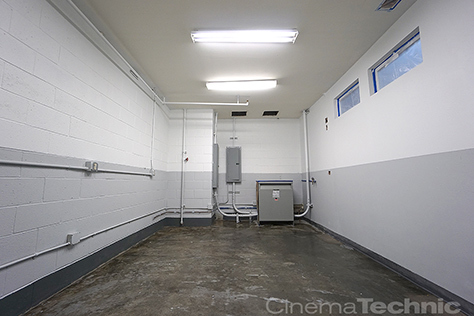 CinemaTechnic will provide full factory authorized service in Burbank, CA. The P+S rehousings are of the highest quality. P+S provide the only rehousing service for vintage Angenieux primes, Canon FD primes, Kinoptic primes, and most notably the Kowa Anamorphic primes. P+S’ Kowa Cine Prominar rehousing are the smallest available, maintaining the original lens’ unique compact form factor, very rare in anamorphic lenses. We invite you to join us at our Grand Opening event, May 20 from 3:30 to 6:00 pm at our new location: 722 N. Mariposa St., Burbank, CA 91506. Our event takes place just after the J.L. Fisher 11th Annual Mixer and BBQ Lunch at J.L. Fisher 1000 West Isabel St., Burbank, CA 91506 which takes place from 9:00 am to 4:00 pm on the same day. We are located within walking distance of J.L. Fisher. We will be providing overflow parking for the J.L. Fisher event at the Hot Rod Cameras parking lot. You can park with us and take a golf cart ride over to J.L. Fisher, and then back again at the end of the BBQ Lunch for our after-party. We will be participating in and providing technical support for the ShareGrid Anamorphic Lens Test. 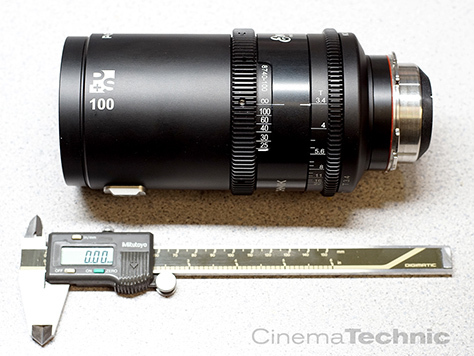 This will be the most comprehensive comparison test of anamorphic lenses where the results will be viewable. 2017 has been incredibly busy for me with the build-out of the new workshop in Burbank and the service work and other projects I’m involved in. It has been exciting but exhausting. So today I’m taking some time off in the Coachella Valley before heading to Las Vegas for a quick tour of NAB. My first full day off since the start of the year! I’ll be making the rounds at NAB Wednesday afternoon and Thursday morning. I’ll be back in the shop on Friday. 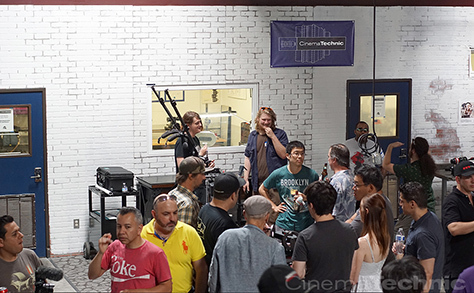 Effective May 1, 2017 CinemaTechnic’s labor rate for Cine Lens and Motion Picture Film Camera repairs will be $150.- per hour. Jobs currently in-progress and jobs estimated before May 1 will be billed at the previous rate of $125.- per hour. The minimum labor charge will be 1 hour for professional Cine Lens inspection/repair. This covers inspection and written estimate for up to 5 prime lenses or up to 2 zoom lenses. This “estimate fee” is charged as a minimum fee if the repair work is not approved, and waived if the work is approved. Except for limited service for Leica-R lenses, we do not service still photo lenses or any autofocus lenses. For ARRI and Moviecam Motion Picture Film Camera inspection/repair, the minimum charge is 1.5 hours labor for camera bodies. This covers inspection and checking the camera’s calibration settings. In many cases calibration adjustments such as Flange Focal Distance can be accomplished during the initial 1.5 hours. The minimum charge for Film Cameras will be reduced to 1 hour for any subsequent service for the same camera body within two years of the initial service. Inspection and adjustment/service of film magazines is at an extra charge depending on the number of magazines in the camera package. Customers are advised to keep in mind that ARRI no longer supports film cameras (Moviecam merged with ARRI), so if parts are needed delays will be inevitable and costs cannot be estimated in advance. New CinemaTechnic Machine Shop and Prototyping Workshop February 2017. As it always goes with remodeling, it took far longer than planned. But the first of my new workshop rooms was finally completed the last week of February. The photo above was taken just after the completion of painting. It seemed so big before I put all my machines and workbenches in there. This room will eventually be the Machine Shop and Prototyping Workshop. But for now I will be doing all my work out of this room. That will allow me to take my time to complete the Clean Room. I don’t want to rush that project. Almost as if on cue the first jobs arrived just as I was getting the last of the tools into the room. I’m looking forward to a very busy March. A lot of long delayed projects will be getting the green lighted.